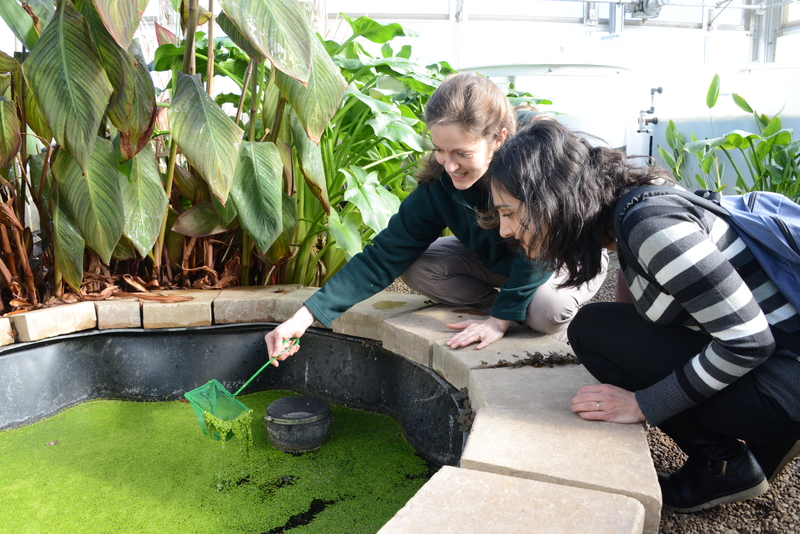 Rachel Brennan, associate professor of civil and environmental engineering, back, shows Ozgul Calicioglu, a new doctoral student in her research group, how to clear out the duckweed in one of the Eco-Machine’s ponds. On a campus where everything’s draped in white, there are precious few spots where greenery can be found. One of those places is the Eco-Machine , an artificial wetland laboratory sheltered in a greenhouse south of Medlar Field just off Porter Road. Run by Rachel Brennan, associate professor of civil and environmental engineering, the Eco-Machine is designed to clean wastewater through the use of natural ecological processes. 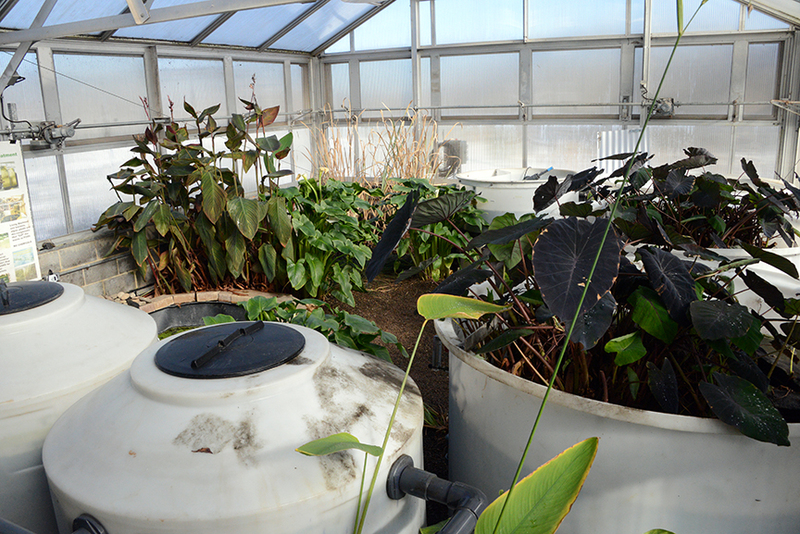 Only a handful of plants occupy the 540-square-foot facility during the winter. Once spring arrives, the Eco-Machine will be teeming with more life. Employing various plants and organisms, Brennan’s Eco-Machine replicates the biofiltration process that removes pollutants in wetlands. Brennan explained that during the winter, many of the plants in the Eco-Machine go into a ‘resting phase’ where they don’t grow much, but the microorganisms in the system still keep the water quality high. Since the system contains so many living organisms, the machine can’t just switch off. Inside the greenhouse, it’s a balmy 65 degrees and the vibrant colors of the resident Black Magic Taros and Water Callas are a stark contrast to the blanket of snow outside. “I reduced the temperature over winter break to help conserve energy, but the plants really didn’t like it,” Brennan stated. 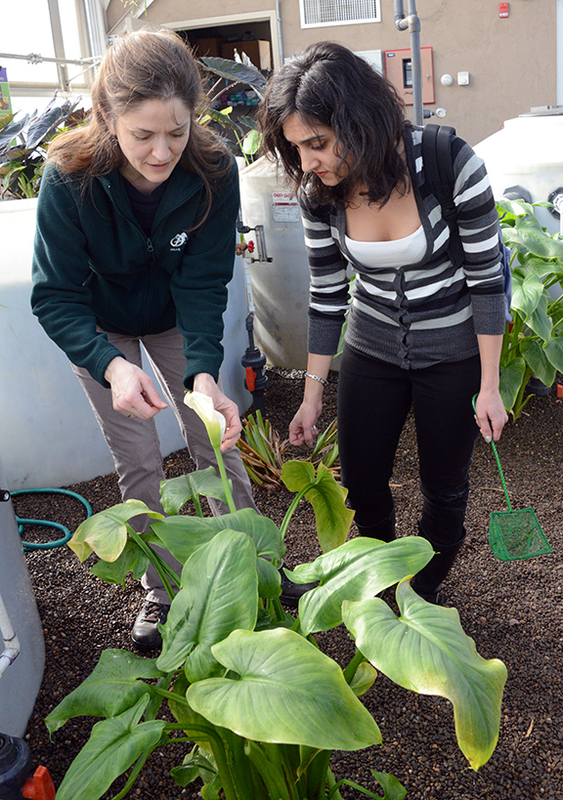 Water callas are among the few plants that live at the Eco-Machine facility year-round. Brennan’s team stops by the greenhouse every few days to check on the plants. She said the plants that are currently in the greenhouse are just a small part of the Eco-Machine. Once the weather gets warmer, the roughly 540-square-foot facility will spring to life with more than a dozen tropical plants to enhance the filtration work. Until then, Brennan and her team will continue visiting the machine every few days to check on things. And because the relatively warm environment can be a haven for bugs, her team keeps vigilant for unwanted pests. “Earlier in the winter, we had a bit of an aphid problem because we can’t open the windows, so they tend to multiply,” Brennan said. To solve the problem, she purchases ladybugs to keep the aphids in check without the use of pesticides. On this particular day, she’s introducing Özgül Çalicioglu, a Fulbright Scholar from Middle East Technical University in Turkey who just started her doctorate in Brennan’s group this semester, to the facility. Brennan shows Çalicioglu how to scoop out duckweed from the artificial ponds. She explains that the emerald plant does a fantastic job of trapping nutrients in water. The environmental engineer thinks that duckweed’s nutrient-trapping ability could be used to prevent runoff into waterways and potentially serve as a substitute for chemical fertilizers. “Using duckweed in this capacity hasn’t been studied very much,” Brennan said. She said she hopes to test duckweed as a fertilizer substitute in the nearby community gardens this summer. After Çalicioglu finishes cleaning the duckweed out of the ponds, the two head back to campus, but will check back again in a few days. 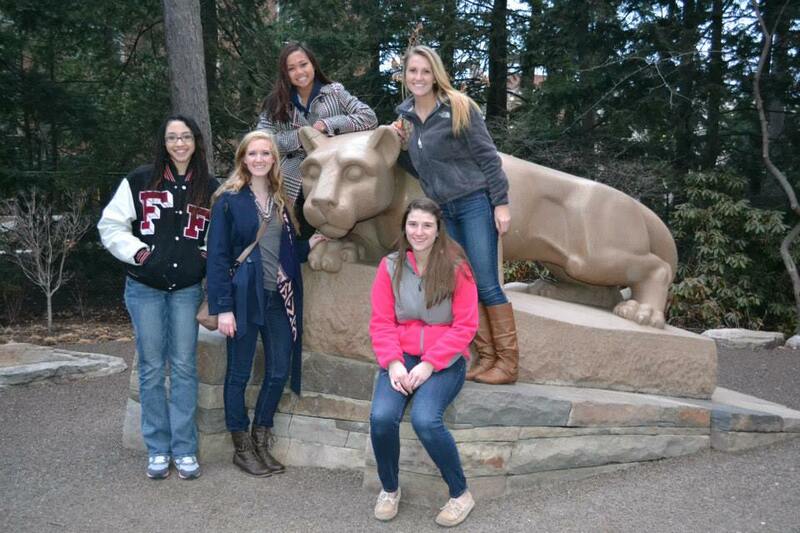 Middle school girls helped to program “dance moves” for robots designed and built by Penn State engineering students. Music from Disney’s “The Little Mermaid” accompanied this particular robot’s moves. 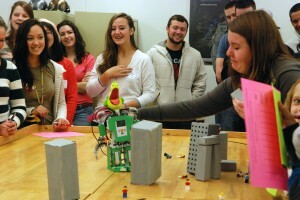 A Godzilla-inspired robot and a lovesick mechanical mouse were among the highlights for two dozen middle school girls visiting Penn State’s College of Engineering on Thursday. 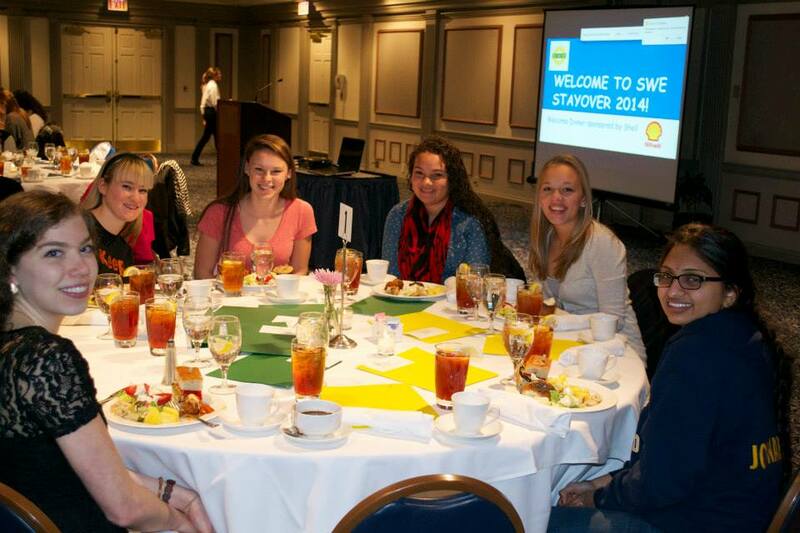 The trip, part of the Women in Engineering Program Outreach Workshop, gave the students a glimpse into what it’s like to be an engineer. The annual event is designed to encourage young girls to consider career opportunities in the fields of science, technology, engineering and mathematics. 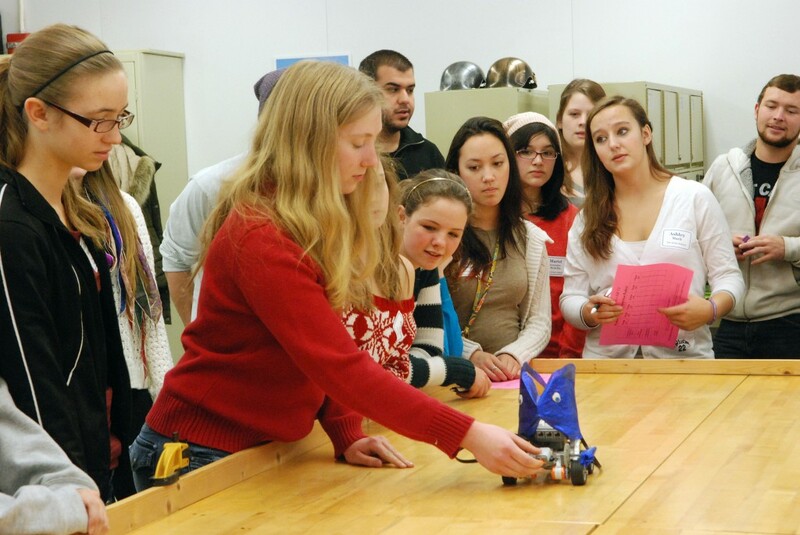 The Gozilla robot gets a helping hand from a student as she steers her creation to knock down a series of buildings during its dance. 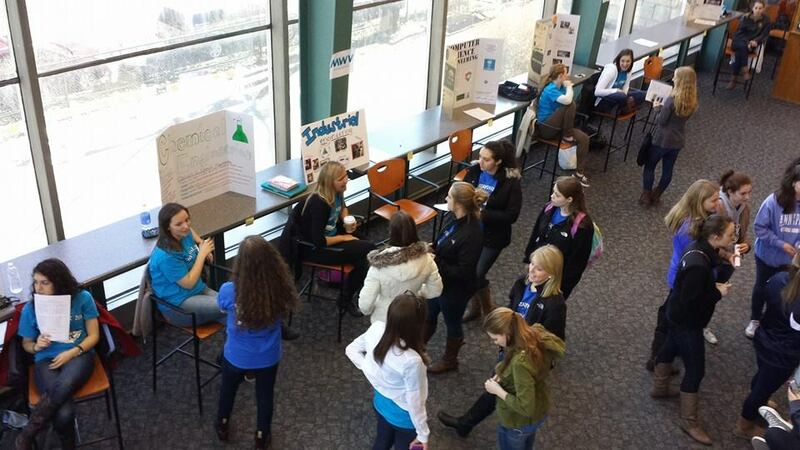 Seventh-graders from Philisburg-Osceola Junior High School, eighth-graders from the Grier School and eighth-graders from Park Forest Middle School spent an entire day meeting Penn State engineering students, touring laboratories and working on hands-on projects. Constructed of Lego Mindstorms NXT robotics kits, the machines’ movements were choreographed with music and in some cases customized to look like a character, such as Godzilla, a mouse or a fish. During their visit, the students toured the architectural engineering department’s Immersive Construction Laboratory, enjoyed a presentation by the Engineering Ambassadors, took in a pizza lunch with engineering students and designed their own amusement park ride.